First off, a very late but still merry christmas and an in-time happy New Year. It has been a wonder full experience to be able to let my so-called “creativity” flow onto the net. I’d like to thank you all for your visits, the last few months have been awesome: to top it off. The blog hit the 1000- visitors mark yesterday … so I’m pretty sure it’s going to be a very happy New Year. Ok, that covers these social obligations, let’s head into some snaphots. This last one is pretty cool because you can see the leg of someone who was in quite a hurry on the right of the screen. After 4 days of taking things easy I’m completely reloaded to head back into the classroom for another week. After that it will be 3 weeks of cramming all those pounds of knowledge from the paper into my cranium. In the last two days I saw 2 films I haven’t seen in the last 6 to 8 years and itwas wonderful to see them again. First off, I am talking about Escape From New York, John Carpenter’s cult-classic from 1981. For those who haven’t seen it yet. In the year 1988 (my year of birth by the way) manhattan island is turned into the New York Maximum Security Prison, a brick wall is built around it and several guard-post are constructed. In 1997, rebels take over airforce one and crash it into manhattan. Attempts of the authority to rescue him only endanger him (and world peace with him) even more, this sounds like a job for Snake Plissken … I’m not gonna tell you more about the movie but I recommend you see it. A second one I saw was Sneakers, a computer related movie without getting to geeky, I won’t go into the plot but it is worth mentioning that the main character is played by Robert Redford and that Dan Akroyd (known from Ghostbusters) takes care of the humor. The holidays are getting closer, after spending most of my money on gifts, I have created my own (and pretty short) wishlist. That’s it really :p, I really fell in love with the Wii and think that it has a lot of potential. Let’s hope that the developers will use this innovative piece of technology to it’s limits. Any suggestions on which model of a camera to take is always welcome. I shot a bunch of video with a pretty standard Handycam last year for my 100-days show in school. After looking at the edited footage again I decided that it might be interesting to get into video a little bit, that explains my sudden interest for a video-camera. I might share these video’s with you some time. Today I had a day off. I didn’t feel like going to school, knowing that the only class I would have was making exercises on English Grammar which i could easily make at home (no to mention the fact that I didn’t feel like getting up at 6 AM). So what do you do when you have a day for yourself in this period of the year .. jup … christmas shopping. It’s high time for the shops, everybody is out there looking for the perfect gift for lovers, family and friends. It’s not an easy task, I don’t think i have to tell you guys that. After an hour of checking all the shelves at the gift stores I had collected a gift for everyone that’s close to me (don’t you think that it’s hard to draw a line there ? Who do you buy a gift and who isn’t close enough to you to give them one ?) The damage to my funds was OK, so it’s a good year :p. Once I got home I took a good look at that room of mine and noticed that it was one big mess. I set off to cleaning the whole mess up and about an hour later I was proud of what I had achieved. That’s what I did with my free time up to now. Tonight I’ll be staying in and will probably catch a movie on TV. Talking about movies, yesterday I went to see the Black Dahlia and I must say that it met with all my expectations. The setting is so cool, the late 40’s seem like a cool time to have lived in. Monday I’m going to see “the Departed” together with my dad, but perhaps more on that next week. I’m not in that much of a rant today so I’m gonna keep it at that. Make sure to check out the first episode of the “from my mind into your ears” podcast a few posts below. 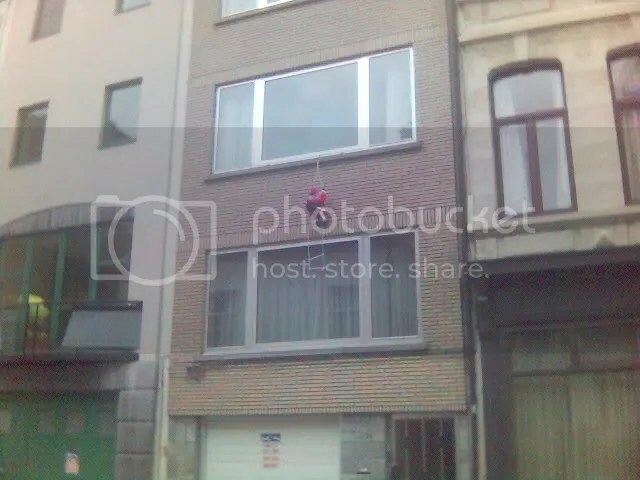 I also posted another picture of one of those awful santa’s some people hang from their windows … again, no taste at all. XMAS is coming ! Enjoy it ! Here it is ! Episode number 1 of the “from my mind into your ears”-podcast. in this episode I talk about the iPod Shuffle 2nd generation, the holidays, life on the go and Belgium. As mentioned a few posts before … some people just don’t have any taste at all.